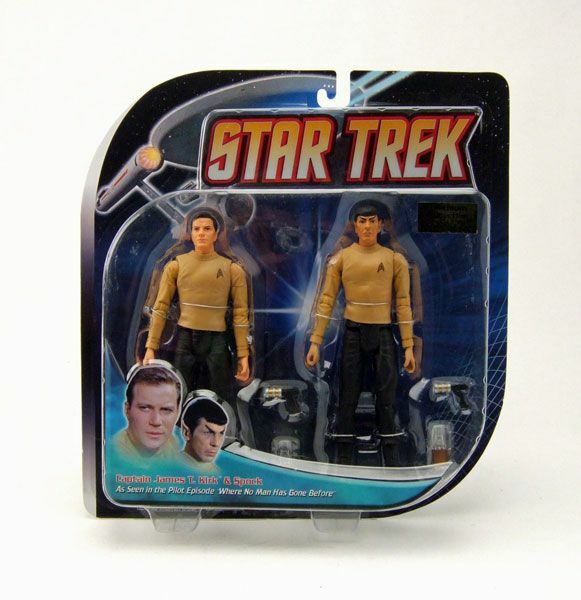 DST released this 2 pack as part of their Classic Star Trek line, with the "all-era-inclusive" style packaging. 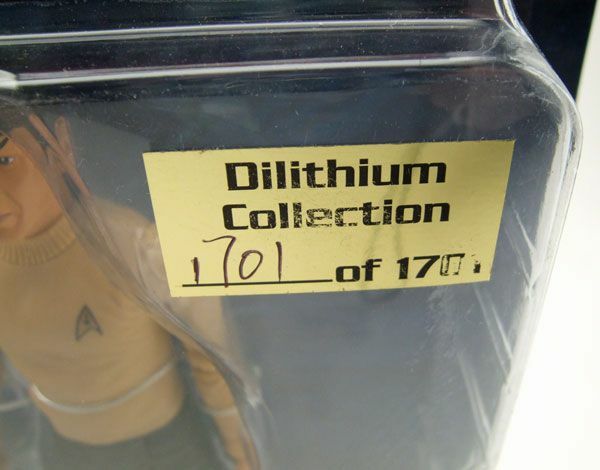 Check out the number on my packaged version! 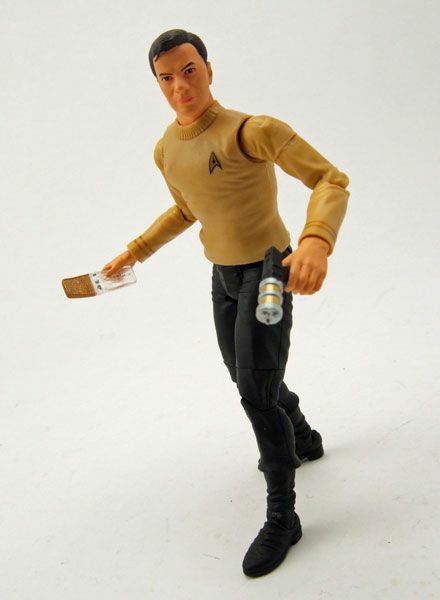 Kirk features the same type of construction we are used to seeing on all the DST releases. 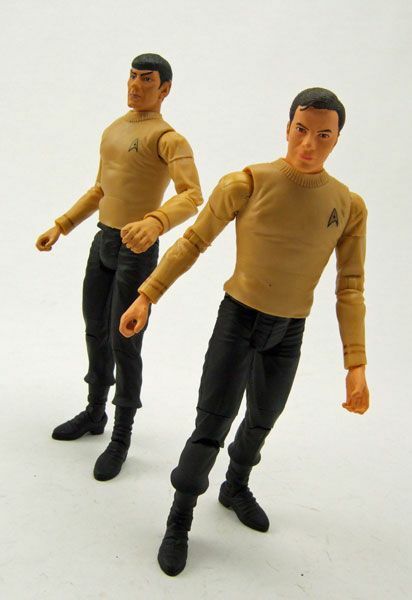 Plenty of articulation, good sculpt, rubber shirt. Nothing really different here. 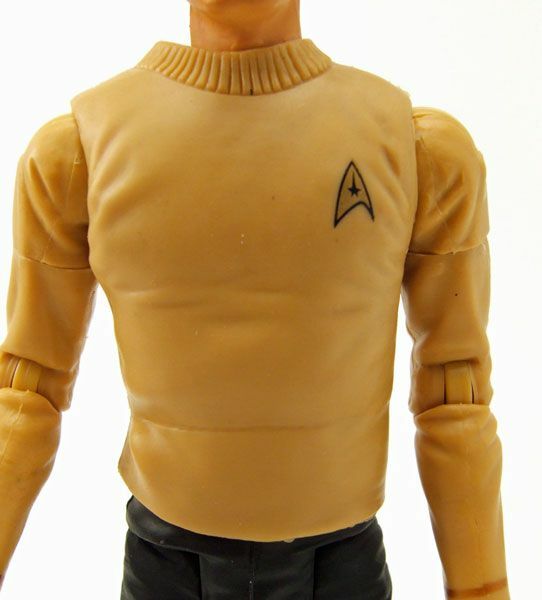 Thankfully, DST went with the new Kirk head used on their recent Season 1 Casual Kirk. I've said it before, but again, I LOVE this head. 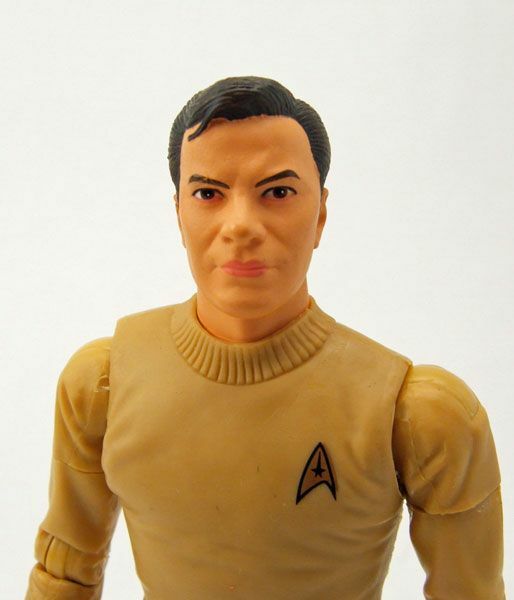 I think it does a much better job of capturing Shatner's likeness over the previous AA sculpt. BUT... I am not that happy with the paint job this time around. 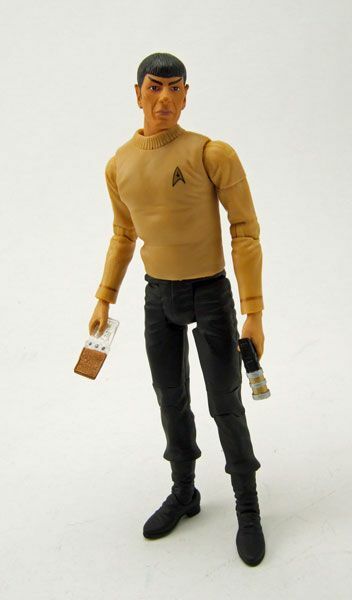 On all three of the versions my shop got in, Kirk appears to be wearing pink lipstick. That small bit of paint throws the look off quite a bit. As it stands, I'm just going to pretend it rubbed off of whatever gal he just smooched. Kirk loves kissing the ladies. 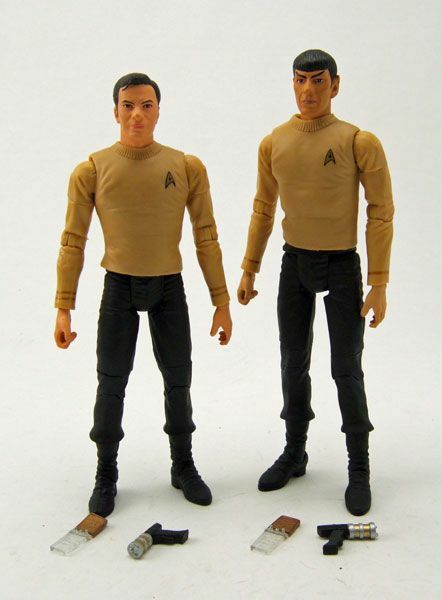 The shirt mold used for both Kirk and Spock isn't new, but it has been altered. Previous releases of this shirt featured a sculpted delta shield on the chest, while these new releases have symbols that are instead painted-on. It's a nice improvement, as the sculpted versions usually turned out really messy. You might want to invest in some sunblock there buddy. Even worse, DST used the same hands on him that they use on most of their releases, so the skin tone on his mitts doesn't match his Hulk Hogan-ized face. Oh, and yes, he too suffers from the lipstick syndrome. Bummers. Next we have a problem we should all be accustomed to by now- the dreaded shirt indent. 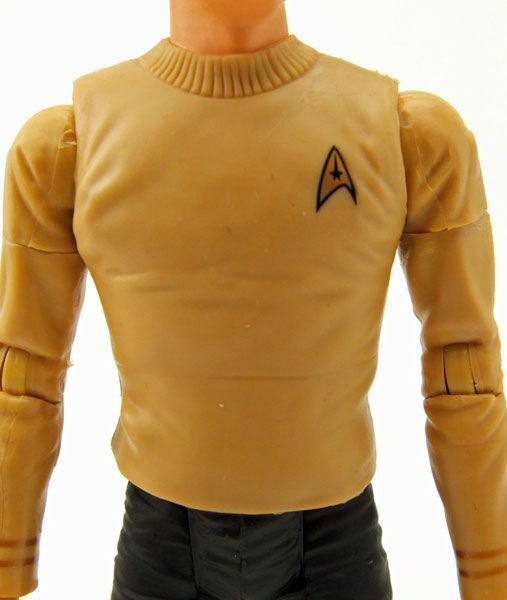 It seems like every "rubber shirt" release lately has been marred by this problem (twist-ties leaving indentations on the figure's shirt), but it always seems to be especially bad on Spock. 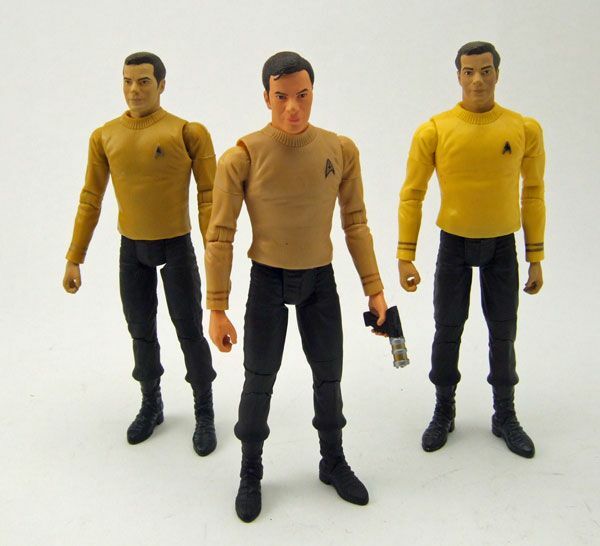 This pack is no different, with Spock showing it much more than Kirk does. 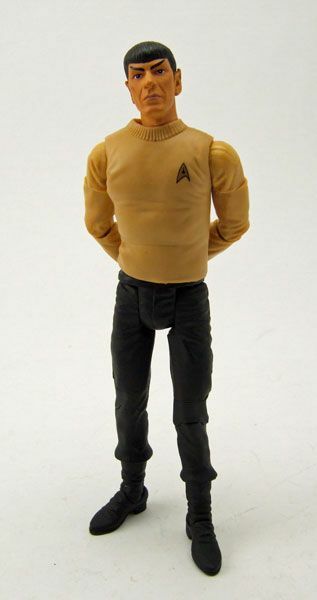 Lastly, he has the same wonky left ankle that most of the recent DST Spocks I've purchased have suffered from. The joint must be backwards or misaligned or something, because the foot doesn't move fully forward like the right foot does. 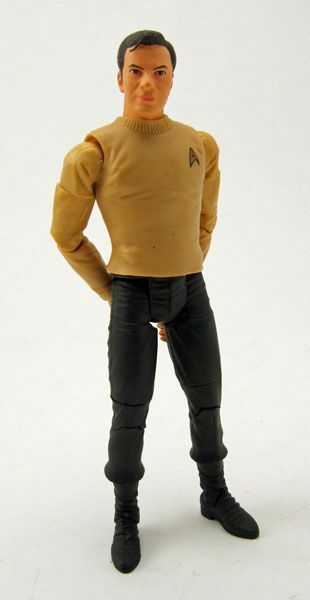 That little issue really limits the poses you can get out of him, which is a shame. These few minor production problems add up, turning what could have been a great figure into a mediocre one. Accessories: Here's where this pack REALLY kicks it up a notch: NEW ACCESSORIES! That's right... Instead of just packing in the same old phaser/ communicator combo, DST sprung for brand new "Cage"/ "WNMHGB" style equipment! 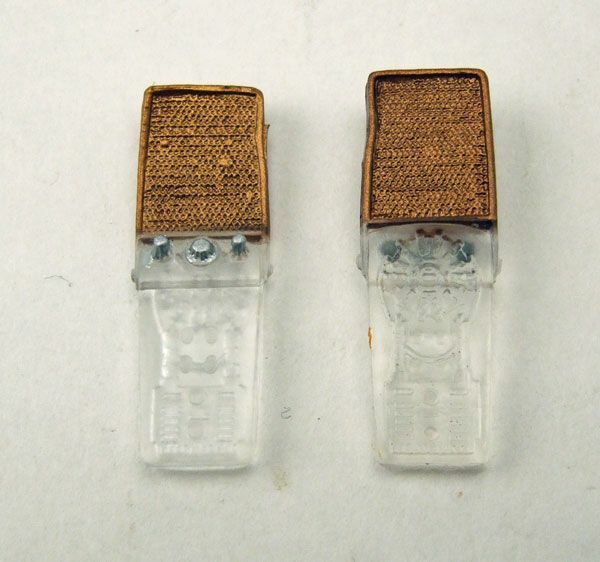 Not only do we get great laser pistols for both Kirk and Spock, but also awesome translucent communicators! 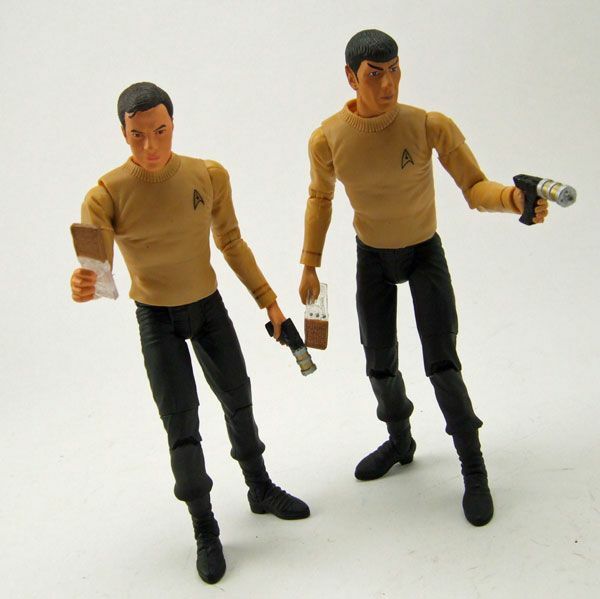 Buy an extra pack just to equip Pike and "Cage" Spock. Would that be so wrong? 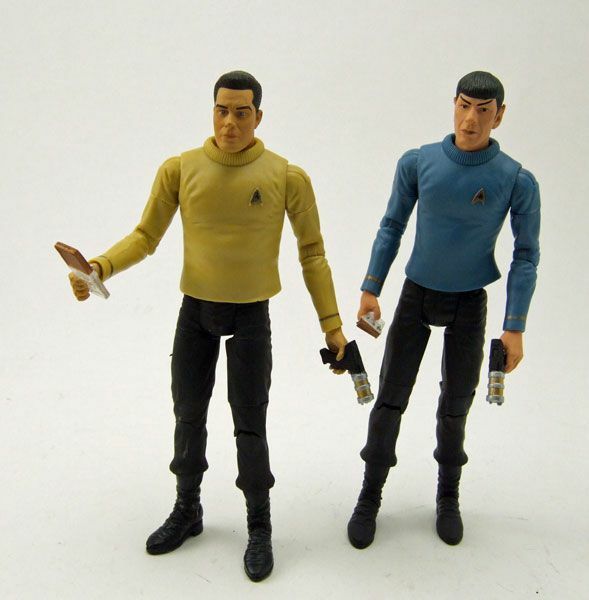 So... to wrap things up, just like the Enterprise Incident set, this pairing has a really solid Kirk coupled with a slightly "meh" Spock. 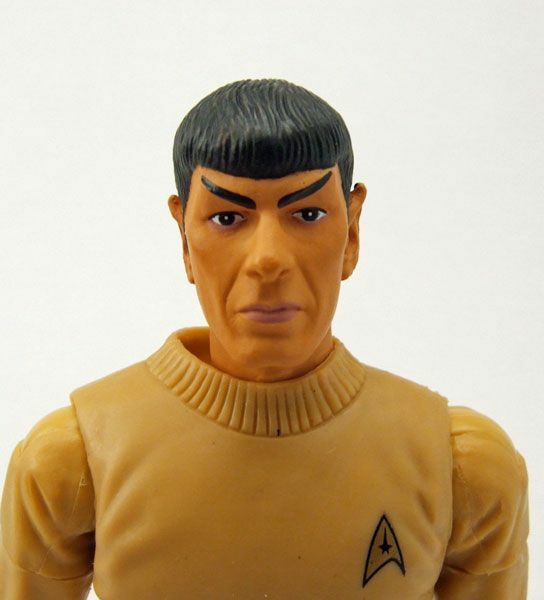 Still, even with all the Spock's issues, I'm pretty happy with this one overall though. 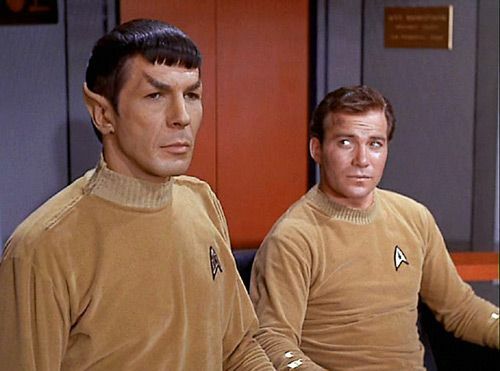 Kirk really does rock, and the fact that this isn't ANOTHER blue shirt Spock gives him bonus points. Add in the brand new accessories and the limited number produced, and this one jumps into the "buy-it-if-you-see-it" category. 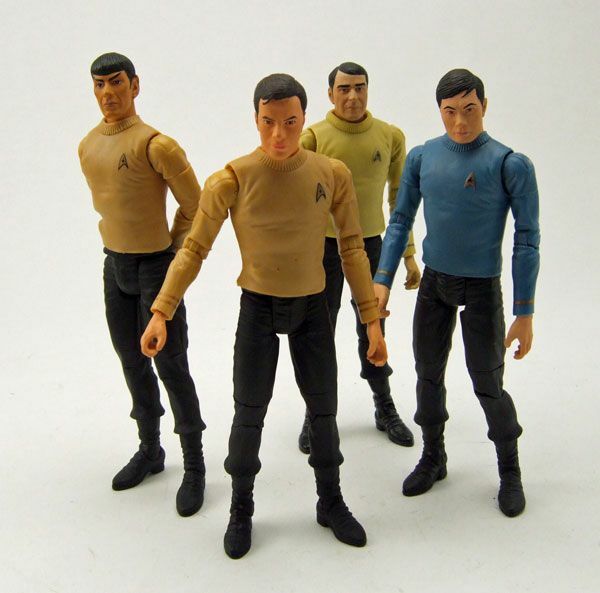 I only wish these sets weren't possibly the last of the AA/ DST figures, as I would easily buy other "Cage" and "WNMHGB" crew using these bodies. Mr. Scott, Gary Mitchell, Jose Tyler, Lee Kelso... A guy can dream, can't he? 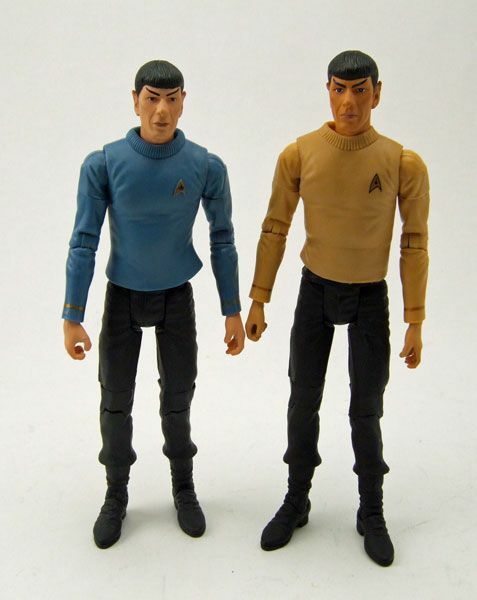 Otaku5003-Hey james, i was wondering would it be better to put pikes head on spocks body, a scotty head on pikes body and the spock head wherever?